Carleton Varney’s “Brazilliance” banana leaf wallpaper at The Greenbrier. I wrote about this wallpaper in 2012 and installed it in our home in 2013. A timeless classic that became very trendy. But how do you define a “trend” and why do “classics” ebb and flow in popularity? My beloved chintz, for example, has been a design staple since the 17th century. Of course we all remember the chintz-filled Mario Buatta days of the 1980s – 1990s. But sadly, chintz all but disappeared by the 2000s, booted out of the forefront by companies like Ikea who in 1996 promoted its modern Scandinavian look with the line, “Chuck out your chintz” (source). Fortunately, it is slowly reemerging after a long hiatus. And don’t forget toile, the French favorite dating back to the 18th century that was all the rage in the 2000s (source). Around that time, designers such as Charles Faudree and Dan Carithers helped usher in the French Country Look. What happened to toile? I rarely see it anymore, yet I have not stopped loving it. Let’s also ponder the antiques market. In the 2010s “brown furniture” suddenly became a bad word, and the price of antiques fell to an all-time low. Mom and Pop antiques shops around the country were forced out of business. All things “pretty” and “traditional” were replaced by “edgy” and “modern.” Grey and beige were all the rage, and wallpaper was “out.” Fine antique furniture was cast aside for new foreign imports. The dressmaker details from the Mario Buatta days became tailored and streamlined… no frills. A beautiful toile bedroom by Dan Carithers graces the cover of Southern Accents (RIP), January-February 2002. Blue and white toile, buffalo check, porcelain, French Country antiques, and a rooster! I am guessing this image (via Traditional Home) is from the 2000s. Design by Anne Page and Marvin Daniels. Large clusters of blue and white porcelain have become all the rage. Stores like HomeGoods are rushing to fill the market for blue and white porcelain. Bunny Mellon used blue and white sparingly and elegantly throughout her Manhattan apartment. So where do we go from here? Will blue and white become the next chintz only to be “chucked out” when the big box stores move on to the next hot ticket? Is Chinoiserie the next French Country, another beautiful and classic look that has unfortunately been largely forgotten? Sadly, design has become disposable… to be tossed aside every few years… out with the old, in with the new… and mass produced from China. And let’s not forget the Santa Fe, Tuscan, and Shabby Chic crazes! I think “timelessness” is open to interpretation and personal opinion, but for me, Mario Buatta (aka The Prince of Chintz) is the Gold Standard. Of course I am biased, as I was a young girl during the height of his popularity, and I grew up loving anything floral, English, and covered in bows. But I have never stopped loving his look… I strayed away from it for years, following the siren song of the trends, but now I am back and determined to never stray again. You may recall from my interview with Mario Buatta earlier this month, that he was responsible for bringing English Country Style to the United States. He told me, “I look at my book, and I look at my past jobs and they all look the same to me because they all have the same feeling – they don’t have the feeling of having been done yesterday. You can’t put a date on them.” As one of the most highly celebrated interior designers of all time, Buatta has enjoyed a 50-year-plus career, and his allure and relevance has not waned. Here Mario Buatta is holding a needlepoint pillow, which he famously incorporated within his designs. 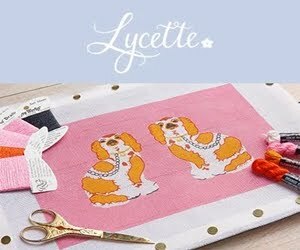 – And by the way, needlepoint – another design classic – is back too… resurrected from “grandma status” by millennial entrepreneur Jessica Chaney, founder of Lycette Designs. A living room designed by Mario Buatta from the cover of the book House & Garden’s Best in Decoration. Another key takeaway is the importance historic knowledge plays in creating classic, timeless rooms. Mario Buatta’s rooms are still timeless today in part due to his vast knowledge of 18th and 19th century design. “So many people don’t know what they are doing, and they place furniture in the weirdest ways. They become decorators over night, and they don’t know the history. They don’t know what was made in 1950 or 1850. They don’t learn it and they don’t study it. Young people today have no reference. They don’t want Grandma’s furniture, they don’t want anything brown, they don’t want anything old,” he said. One of Buatta’s clients is Patricia Altschul, and I had the privilege of interviewing her on the subject of timeless interiors. Buatta has designed four homes for Altschul, and her now iconic Charleston home happens to be my favorite of all time. “I never get tired of these things… I’m not one of these women who always changes everything. I will never redo my home,” she said. For further expertise on the subject of creating a timeless home, I turned to two more of my favorite designers: Leta Austin Foster and Holly Holden for their tips. After speaking with Leta, Holly, Patricia, and Mario on this subject, one thing that resonates is the use of antiques. Antique furniture and mementos add to a sense of timelessness and that “collected look” of having “always been that way” as Mario would say. Designer Holly Holden is the author of The Pretty and Proper Living Room, which should be required reading for anyone looking to create timeless interiors. Holly shares a few of her tips here. And there is a section on (antique) blue and white porcelain in her book! Leta Austin Foster’s book Traditional Interiors is also a must have! In conclusion, succumbing to trends is a very expensive cycle carefully calculated to drain your pocketbook. I personally am guilty of falling prey to so many of them! How can it be avoided? “Be yourself. Everyone else is already taken,” Oscar Wilde would say. Invest in the classics. Don’t break up with them just because they are no longer popular with the hipsters, and don’t feel compelled to participate in every craze you see on Instagram. “Make your house a scrapbook of things you love in your life; your memories…Nothing is better! Treasure those memories,” said designer Penelope Bianchi – a mantra Mario Buatta has perfected. And most importantly, buy what you truly love, and you can never go wrong – whether that is a priceless antique or a HomeGoods ginger jar. Be judicious with your purchases, and invest in the best you can afford with the intention of keeping your treasures for a lifetime. The living room in Mario Buatta’s New York apartment, featuring his legendary collection of dog portraits, which he jokingly refers to as his ancestors. Mario Buatta for Patricia Altschul… No one does blue and white better than Buatta! « Has Blue and White Reached Saturation? Thank you so much for these posts! Trends come and go. I love them all. But good design is timeless! I appreciate your pictures and words. They are decor affirming!? timeless information and creativity. Intelligently written with beautiful illustrations. Thank you for sharing! Your whole month’s worth of posts has been a treat to read and a feast for the eyes. I love your blog-it’s my daily restoration of hope for humanity! But seriously, I never tire of these beautiful photos-when everyone around me seems to be redoing their interiors in the latest trends, I look at your posts and am reassured by my own aesthetic. Thank you! I loved this post and coudln’t agree more. There were times I would look at a room in my house I was trying to decorate and think to myself…I have no idea how this is going to turn out (as my mind would be running in every direction from colors to fabrics) but I do know one thing…it will be timeless. :-). This made me feel so much better. I sell Real Estate and although I know there are important elements that go into selling a home, I am tired of seeing all the same beige, chevron and blue and white objects you discussed. None of it is unattractive but growing up with parents who were collectors and could move the contents a traditional colonial home to a 4,000 sq factory space in New York City I love the concept of incorporating the old and new. I always think of my father saying “It’s just soo vanilla”. Today I feel like it’s ok to still have books on your bookshelf. Thank you! I very much admire Ben Pentreaths sense of style. English with a twist. Most things are good in small selective doses. This is my favorite blog and it’s so easy to see why! Congratulations on this terrific post. I so enjoy reading your blog, especially this anti-trend series. My wish, like yours, was granted when Mario finally presented us with his wonderful book! He’s still my favorite. And after reading your post featuring Holly Holden, I purchased her Pretty & Proper Living Room book, and I completely agree with you that it is practically a text book and should be required reading (even though her proofreaders don’t know the correct spelling of “mantel”). Thank you for sharing. Andrea, you are a star! Thank you for the effort you put into this blog and for really thinking, having an opinion and all the research! This series has been interesting, scholarly, thought provoking and insightful. And I second all of the above comments. You have made the case for traditional interiors and I am 100% sold. You really have the very best blog. Thank you again and congratulations! Thank you for the wonderful series. A bonus to me was to read all the comments and realize a great camaraderie exists among us. I look forward to seeing what you have next for us. This has been the most amazing month of articles. I have loved everyone of them. I have always loved traditional and still love my old decorating books. I still pull them out even though many are from the early 1980’s. Thanks for coming up with such a great month of discussion. It was fun reading all the comments too. This may be the best blog post I have ever read! I have always loved classic design, but it is difficult to convince younger clients that it’s more affordable to collect things of lasting beauty and value. How encouraging to see that perhaps we are going back to that idea, even if it is with baby steps. Thank you for this series about anti-trends…what a breath of fresh air. Thanks for this post- it pretty much sums up my design philosophy…classic and timeless! I still love chintz, toile, antiques, and accessories and am obsessed with antique blue and white! As a designer I am really not a beige person and am so happy that color is once again “back”!! It never left for me! Andrea, This whole anti trend series that you have started is fabulous. Interior Design is all about an individual and not what is in today. Trends are for people that have no conviction and must follow and be herded into what is the latest. I cringe when people ask me what’s in. What’s in is what you love today and will love forever. Be yourself and live with what you love. Step out and be yourself. Hopefully this series will educate some and validate what so many feel. As a professional Interior Designer I applaud your efforts and giving recognition to our industry greats such as Mario Buatta and Leta Austin Foster. Thank you. Those “in the know” will always like good traditonal interiors , when something is widespread it looses its appeal. That said ,traditional does not always equal beautyful. Good taste (rare) is the key. Sixties and was very impressed with his demeanor. his work for all to enjoy! I have loved all of your posts about anti-trends! Please keep up the great work! I think younger people will see the light once they have embraced a few trends only to see them bottom out and go completely out of style. That is how I learned my lesson! M growing up years involved many moves to many continents and never too long in any particular house. My mom was great at setting up quickly and making a lovely, homey space (even when my parents were enamored by Danish Modern brought back with us here to the states!). For me, that instability left me longing for more permanence and whenever I was in a home that had evolved over time and been curated through generations I was like little 8 yr old Mario wondering why we didn’t have that type of beauty in our home. Naturally when I grew up and married in the late ’70s I decorated in an American version of English Country that felt passed down, well-loved, collected and timeless. I never had the luxury of generational fine furniture so I gravitated to what I could afford to buy, early American crocks and textiles and graphics. (probably because my heritage is very southern and that what I’d see in the homes of my Aunts and grandparent). Even though I always have fresh, current accessories in our home and others told me our home was beautiful, for a long while it felt dated, out of step, old fashioned. But since I didn’t love the all-gray look (looked like Water World to a color lover like me) and I’d already done French Country & Primitive Country in the ’80s I wasn’t about to throw out all the things I love just to appear ‘with it’. You writing this blog has affirmed my style. It’s got to be a TON of work on your part because you research and inform instead of just copy and paste pretty pictures. So, thank you. Personally I don’t think you can just look at pictures, there has to be an understanding of the how and why behind it when decorating. That’s why Instagram and a lot of blogs feel so boring to me. You have introduced me to some of the legends of design and some of the new Traditionalists and I’m still learning. Yes, yes, a hundred times! My house doesn’t look like a Restoration Hardware ad and I often wonder if I’m an old soul because of the things that I choose for my home. Most of my friends don’t even know what Staffordshire dogs are and I’m only 52. Love your blog and am so glad that I found a kindred spirit! Thank you!!!! I think I’ve found my soulmates here! I have always loved blue and white, especially dishes which I have hanging in my house. I’m a plate person. I have also loved toile! I call the look I have now French Country farmhouse! Lol! I do like some trendy pieces… not because they are trendy but because I love them. Some people buy things because they are trendy. I buy things I love… if they happen to be trendy… oh well. But mostly I am a traditional person who likes some old furniture, brown and painted. My friends will say your house is nicely decorated, come help me with mine and I say… buy what you love! Thanks for your article, I enjoyed it.